There’s no doubt that the most wonderful time of year can also be stressful, whether you’re hosting the festivities or traveling to them. But most holiday survival guides only offer strategies for how to handle the pressure when you’re in the middle of it. We want to help you plan ahead so you can enjoy the celebrations rather than feel sabotaged by them. 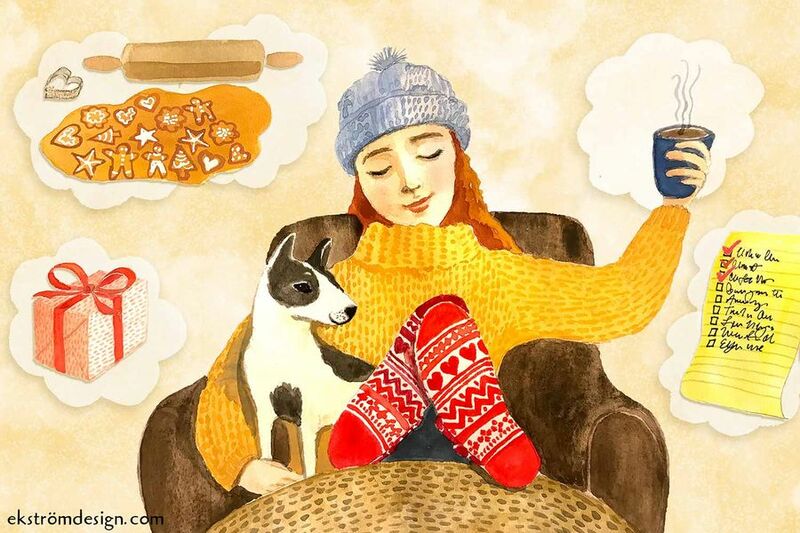 Whether you’re anxious about cooking for a crowd, worried about finding the perfect gift, or feeling guilty about needing some alone time, here are seven tips for surviving the season before your worries kick in. The word “delegate” is in nearly every holiday survival guide, but the suggestion of when to pass on responsibilities is always a little too late. Don’t wait until you’re stressed out to ask for help peeling potatoes or setting the table. If baking isn’t your thing, ask the baker in the family to contribute. Alternatively, send an email to everyone attending your dinner with a list of what you plan on cooking and whatever else needs to be done and ask everyone to sign up for a task. Include everything from picking up sparkling cider from the grocery store to plating appetizers to washing dishes. Whether it’s for groceries or gifts, frequent trips to the store are inevitable, but that doesn’t mean they can’t be more functional. Instead of trying to find time to both shop for gifts and attend get-togethers with friends, do them at the same time. Plan a time where you can meet some friends for coffee and then do your shopping together. You’ll get some much-needed friend time in, and it will make a sometimes daunting task more fun. Instead of spending hours alone in the kitchen making cookies, host a baking party. You’ll get baking out of the way and enjoy quality time with your friends. You might even convince them to do a cookie exchange so your dessert table can have a little more variety with a lot less work. If the party circuit is wearing you down, make a plan for getting out before you ring the host’s doorbell. If you only want to briefly stay at a gathering, let the host know when you arrive. Sandwich your, “I can’t stay long!” with something about how you didn’t want to miss the party and how excited you are to try their famous dip, this way, the host won’t feel offended when you slip out early. If your significant other is in tow, check in with each other ahead of time and set expectations about when you plan to leave. We’re not sure who made the rules that holiday feasts have to be dinner. Instead, consider hosting a brunch party and purchasing bagels, pastries, and sandwiches, rather than making them yourself. All you have to do is set out a mimosa bar and some fresh fruit. If you prefer evening gatherings, host a cocktail party instead. Make a dip and crudité platter, a cheese and charcuterie board, and mix up a batch cocktail. Alternatively, opt for a potluck. Assign a dish to yourself and have everyone share what they plan to bring ahead of time so you don’t wind up with three platters of potatoes and no dessert. Self-care may seem like an afterthought during a time when gathering with friends and family is a priority, but giving yourself permission to reset is essential to enjoying the season. Go for a solo run, take yourself to a movie, or find a quiet corner to read a book with your morning coffee. If it’s hard to find the time once the festivities have started, talk to a few family members in advance and let them know that you’re going to skip dinner to take a night to yourself. Setting expectations before you arrive will make it easier to carve out alone time. Hoping your presents don’t wind up in the re-gift pile can be anxiety-inducing. Instead of buying something for everyone in your family or friend group, suggest a white elephant or secret Santa gift exchange instead. Everyone buys one present and goes home with one, guilt-free. If you don’t think that’ll fly with your crew, consider making something instead. Homemade beauty products, chocolate truffles, or a spiced winter syrup for desserts and cocktails all great ideas.